Granule machines are extruders used for recycling-reclaiming waste plastic to produce raw material. Netplasmak manufactures granule extruders to be used for recycling polyethylene, polypropylene and other types of polymers. Used plastic is first processed in a agglomerator or crushing machine for size reduction and material uniformity which exist in Netplasmak's production line. After preprocessing polymer, product is fed into granulator to produce granule raw material. We produce every granule machine to meet exact needs of our costumers. Screw's material is DIN 1.8550 or DIN 1.4140, with special hardening its life-time will be long. Thanks to special ceramic heaters, heat stays in the machine and initial warm-up time is reduced and energy saving constantly be ensured. With PLC control system, you can control all the heat zones, cutters, hourly capacity. PLC prevent errors caused by the operator. Granule extruders has different sizes of screen changers. Nitrogen hydraulic unit changes filter screen within less than 1 second. In the die there is a pressure sensor. When the filter is full, the sensor gauge the pressure and change it automatically. Molten plastic pass through filter unit and foreign matters are removed from plastic. Filter units are produced as dual side plates and a hydraulic piston changes filter plates quickly without interrupting material flow. We produce filter units in different diameters (up to 5000 mm.) depending on extruder capacity and customer choices. 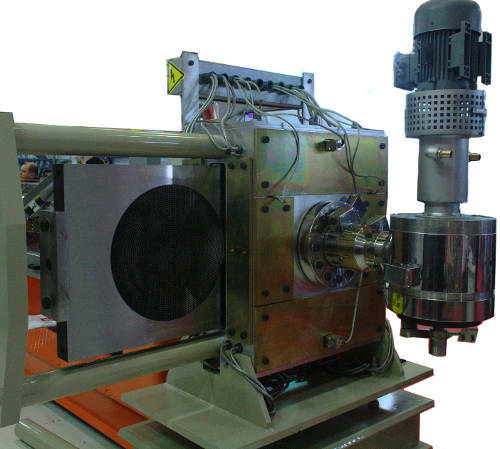 Output material of the granule extruder can be converted into granules whether by die face cutting unit or by macaroni system (strand pelletizer) cutting. 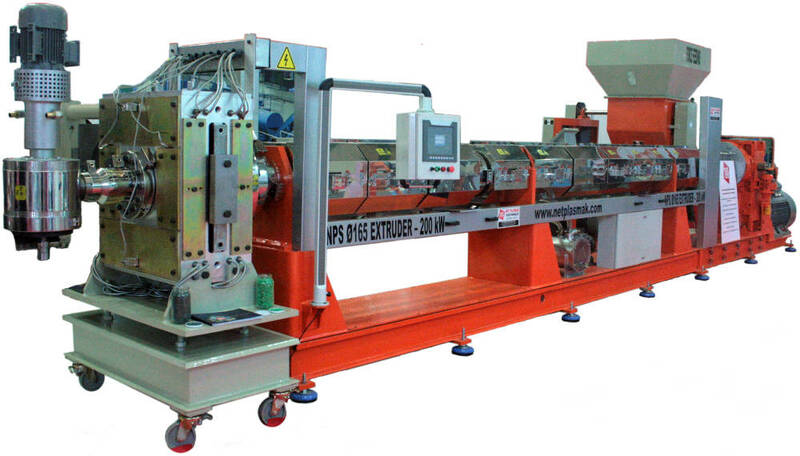 In the die face cutting unit, molten plastic is cut immediately when it come out from die. Cut granules are cooled by air or water depending on capacity of the extruder. In macaroni system, plastic material come out of die as strands. Cooled by passing through a water cooling pool, plastic material cut by front cutting unit and converted into granules. In the die face cutting unit, plastic material cut in the molten state and drop into water for cooling. In cooling unit a close loop water circulation carries material into separator. After plastic cooled, a high speed centrifuge separate plastic granules from water. Because this machine work with water, it made of stainless steel.